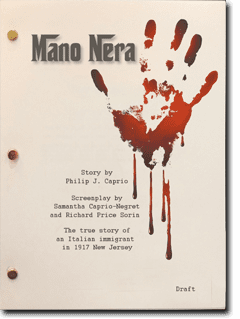 Logline: The true story of an Italian immigrant in 1917 New Jersey who struggles with the decision to avenge his brother’s death by killing the head crime boss of the Mano Nera (Black Hand) Society, who is having an incestuous affair with his first cousin… and is also his wife’s brother. In modern-day Florida, Angelina Romano is on the verge of divorcing her husband, Michael. She seeks her parents advice; her father, Frank Azeglio tells her a true story about her great-grandparents… a story of deep commitment… a family secret of love, deception, murder, and revenge. Salvatore Farina (27) and his older brothers, Joseph (29) and Gustavo (37), own and operate a produce store in Jamesburg, NJ in 1917. Gustavo is married to Francesca Farina. Gabriella and Francesca are first cousins. Gabriella has an older brother, Vincent Greco, who is a boss in the Black Hand Society (Mano Nera). That means Vincent and Francesca are also first cousins. That’s not stopping them from having an affair. They conspire to kill Gustavo and make it look like a robbery. Vincent goes after the Farina’s grocery business. The Farinas realize Vincent had their brother, Gustavo, killed. The police are unable to help them. Gabriella confronts Francesca and Vincent about their affair and how it’s tearing their families apart. Vincent alludes to killing Salvatore and Joseph if they get in his way and incestuous relations with Gabriella. Gabriella always knew there was something dark and violent inside her brother. Salvatore comes home from work that evening to find his wife crying alone in the dark. When he asks what’s wrong, she tells him that he has her permission to kill Vincent because she fears that Vincent won’t stop till Salvatore and Joseph are dead. Salvatore and Joseph purposefully run into Vincent at the Freehold farmers’ market, where merchants of all ethnicities gather to sell their goods. In an effort to protect his brother, Salvatore sends Joseph to the other side of the market and lures Vincent away. Salvatore instructs Vincent to turn his truck down a dirt road. Vincent, wise to Salvatore’s ruse, pulls a gun on Salvatore. Joseph had seen them leave the market and catches up at this point. Vincent pulls the trigger, but his gun jams. Salvatore pulls out his gun, sticks it under Vincent’s chin, and fires. The bullet enters the bottom of Vincent’s chin and exits his mouth taking teeth with it. Injured, Vincent exits his truck and runs for his life. Salvatore quickly catches up with him and shoots him five more times. Joseph catches up to Salvatore just in time to see him put the last four bullets into Vincent. Salvatore is still pulling the trigger even though the gun is empty. Joseph grabs Salvatore by the shoulders and tells him Vincent is dead. Salvatore tells Joseph to go and grab the gas can out of the truck. 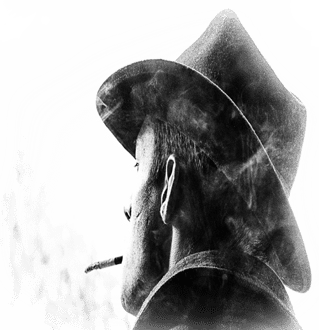 They dowse Vincent’s body, set it afire, and watch him burn. The police find evidence and witnesses linking the Farina brothers to Vincent’s murder. The trial begins on November 13, 1917 and lasts three days. Their defense attorney makes every attempt to discredit the witnesses and facts in evidence. After two hours, the jury finds Salvatore and Joseph guilty of the murder of Vincent Greco and recommends a life sentence without the possibility of parole for each. Salvatore tells Gabriella to forget about him and meet someone else who can be a good husband to her and a good father to their children; she refuses. Salvatore with Joseph’s help runs crooked card games in prison. He sneaks the money out to Gabriella in gum wrappers and cigarette packs. Salvatore’s card games gain the attention of Tony “The Clip” DiAngelo, a made guy in prison. Tony tells Salvatore that he got a ‘pass’ on Vincent’s murder because what Vincent did is an infamia. Tony tells Salvatore that he can use a man like him; that he can make Salvatore’s family more comfortable while he’s in prison. Salvatore discusses the offer with Gabriella. She reminds him that the Black Hand Society is the reason they’re in this dilemma. Salvatore is conflicted because he wants his family taken care of, but Gabriella convinces him that nothing good can come from joining Mano Nera. Salvatore and Joseph are in jail for twelve years. One day, Gabriella visits Salvatore in prison and tells him that he’s being released. Gabriella reveals that she’s been paying off the judge to commute their sentences with all of the money Salvatore had been slipping her. Salvatore and Joseph are released from prison. They sell the properties that were once their grocery store and homes, move the whole family to Florida, and open a motel business. Salvatore and Gabriella have another child. That child is Frank Azeglio’s mother. Angelina goes home and she opens the door to find Michael sitting on the couch, holding a dozen red roses with a loving smirk on his face. She looks at his pleading, puppy-dog eyes and can’t help but smile back.